Hi, I bought a package of Fig Newtons yesterday and they come in a new package. The bottom of the package would make some fine Tudor windows. It has a diamond pattern molded into it and we could paint or use permanent markers to make that look like leading. Look at the bottom of other cookie packaging for the diamond pattern. Good reason for buying cookies, "I just had to have the package for the windows in the new house I'm building! Munch, Munch." In the produce department cherry tomatoes come in green plastic baskets. Some of them have a Gothic pointed arch pattern. They are good, too. They make good mullions for windows and if you are into building chairs, you can use parts of the pattern for the chair backs. The part between the sides and under the top rail. I was at a beautiful paint and wallpaper store in Edwardsville, IL. Their wallpaper book section looked like a library! I love the little sample paint pots, don't you? On to the purpose of the post: Thomas's Liquid Stainless Steel Craft Kit. I saw this on the self and wished I had had this when I was making the kitchen for the corner cabinet. I used Rustoleum Stainless Spray Paint. Wasn't too happy with it, but I thought that was I had to choose from. The web site is: www.liquidstainlesssteel.com It shows how to do it. My store had a kit that would do a toaster size project, plenty for us. 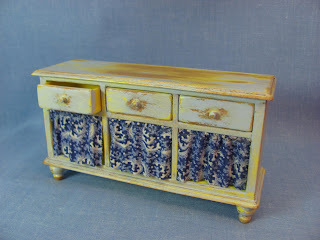 It makes me want to redo the kitchen, but I am having too much fun making the upholstered furniture! Have to say "Hi" to Lotti, and thank you. Lotti is a miniaturist from Germany. She purchased the navy wing settee from the CDHM site. My chicks are growing and will be making the transition to outside soon. They won't be laying eggs until late August or September. I cleaned out their pen today and I always put them into a big box to stay in while I clean. They don't stay in it very well anymore. They jump up onto the side and down onto the floor. Today I had about 5 walking around while the others were sitting on the edge of the box. Ginger, the bunny, got involved but wasn't impressed. They didn't care about him and wouldn't move when he nudged them. Then Zeus, my cat, jumped over the door and he was interested in all the movement. Oh, what fun. He was soon shoooed out. Hi everybody! I know I haven't put anything new up on the blog lately, sorry. My husband and I have adopted 2 donkeys from the Missouri Humane Society. We are getting them settled in. I am finishing an order and have 2 more to go. I have a project planned and I am trying to get that worked out in my head. Just a little tip for the spring mini gardens: Use color photo-copies of leaves from seed and plant catalogs for your leaves. Scan them in and resize and print. You will have to color in the backs, but they look very good. I have a tip for you for d.Anne Ruff's Pretty Pleater. Mary, my friend, needed to make some shears for her living room. She had some full size shears she picked up at her thrift store. I have to say here she is the best thrift store shopper, and she has the best thrift store, ever. I live in a little bigger town with more available and I can't find a thing! Anyway, she was having trouble with the pleats staying in and the iron interfacing wasn't going to work because it would show through. The fabric was definitely polyester, but I think this could work on other fabric's content. I would think twice about using it on silk, though. First glue your hem in and be sure that you have enough fabric allowed for the length of the window. Spray the fabric with spray starch and lay the fabric, wrong side up onto the pleater and start making the pleats. Make sure all of the pleats stay in, use extra pieces of strip wood to keep them in. Iron with a dry iron. Leave the fabric in the pleater to dry. I wanted to spray the fabric with a varnish, a finish, something to sort of make a hard finish on the fabric to keep the pleats in. Mary had Krylon's mat finish so we used that. I would mask off the part of the pleater that doesn't have fabric on it. I don't know how the Krylon and a hot iron would react to each other. I suppose you could clean the pleater off, would paint thinner hurt the rubber? I sprayed a couple of light coats and let it dry. I carefully peeled off the Pretty Pleater, not the fabric, and the pleats stayed. They turned out beautifully. The Krylon didn't show through to the other side. Follow the Pretty Pleater instructions for the rest of the finishing for the curtains. I hope this helps, I know I stayed away from doing shears because I couldn't get them to stay pleated. Sometimes when someone asks you about a problem you think about it a little harder and you find the answer. Labels: How to make use of sheer fabric on the "Pretty Pleater"
I have some new furniture to put up. I also make wooden furniture and wicker. I have some samples I have made and no place to put them so I thought I would sell them. This is another trial for Mary. 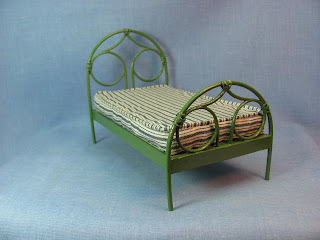 She needed something that looked like an iron bed. This is made from basket weaving reed and painted green. I've made a little mattress for it, too. You could repaint it any color you would want. The measurements are: 6" long, 3 1/2" wide, the headboard is 4 3/8" high and the mattress is 2 1/16" off the floor. $15.00. I do charge for shipping, let me know what pieces you want and I package it up and take it to the post office and they weigh it and I e-mail you the total. I tore apart my workroom today. Since I am really just making upholstered furniture now, I needed to rearrange things and give me a little more space on the table. I have a 3 foot by 6 foot table my husband made for me and I had 2 table saws, a scroll saw, a router table with Dremel and a drill press with another Dremel in it, oh yes, and 2, 2 tier paint lazy susans. I work in a little space somewhere in there. Moved the knitting machine, yes knitting machine. I used to do that, wrote a couple of books for it, wrote for a magazine, too. Loved doing that, until I found miniatures. I didn't want to move the knitting machine too far, I can make little afghans with it. Honestly, it takes more time to finish the little things than to actually do the knitting. Put a table where that was and put the drill press and scroll saw on it. Moved more books over to the bookcase in the other end of the room to make more room for the Rubbermaid boxes of fabric I collect. I don't like having the books over there, but I needed the room. It does have a better flow, now. I wanted to keep this blog non personal. Just techniques and tips. But I have made friends, really good friends, Katina, so sometimes, if you all don't mind I'll let you know what I am doing besides giving tips on miniatures. Another thing you need to know is I have a friend in my work room, his name is Ginger. He's my rabbit. He was supposed to be a girl, but he turned out to be a boy, the name stayed, he's orange with a little black. I've been told he's a Harlequin rabbit, I don't know, he's my buddy. Ginger chases the cats out of the room, I let him run loose in the room during the day. The door to the room is sawed in half, horizontally, like a "Dutch Door". The cats jump over and then they jump back out. I'm sure they have issues with this since they also go outside and we live on five acres and they hunt rabbits. The outside rabbits don't chase them. He uses a litter box if you are wondering about that. Right now we have visitors in the work room, I am raising baby chicks to replenish my laying hens. A lot of peeping going on. Kinda like Easter everyday with chicks and a bunny! I can't believe it! So you are "The Dangerous Mezzo". I just put the sofa up to show it off and I thought I would look for comments. I love comments! And I saw yours, such coincidence. I do hope you have fun decorating and send pictures, I love pictures! I feel honored to say I have you as one of my customers. I found your blog and I love the tudor castle, that's a big project, but it looks like you have it under control. This is the newest custom piece of furniture I've made. A miniaturist from Nova Scotia ordered it. I'm glad she did. It gave me a chance to work out how to make the middle cabriole leg. This is fabric she picked from my stash. Oh, my stash of fabric, I've been collecting for awhile just for mini work. I used to own a fabric store so I love fabric and can't get enough of it. 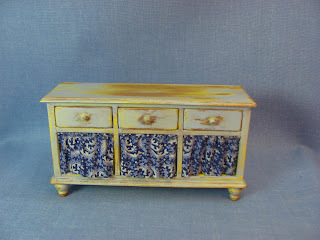 This is the painted finish I was telling you about in a previous blog entry. I was watching "This Old House" and they went to a custom cabinet shop to see this finish. It was going to be on the cabinets they were putting in. I changed everything to craft paint for us and it worked out beautifully. The colors I used are for the sample experiment, any craft paint would do. 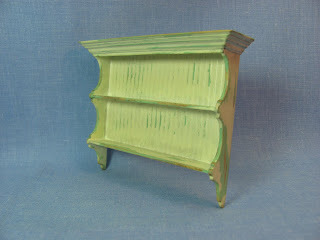 Paint base color, for the sample I used Delta Wedgewood green. Sand lightly with 220 grit sandpaper. Second coat with base color. Don't sand, want to leave for texture, something for the top paint color to grab onto. 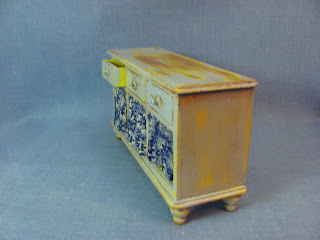 Paint the top color, I used Folk Art Vintage White. Can I say paint heavy? This coat isn't neat, leave brush strokes, light and dark areas. I like to leave this overnight. Sand the top coat lightly showing more base color. I used 320 grit in a circular motion. Add texture, dent with a rock, one with alot of different edges. On the show, the mother of the owner did this with a broken brick for different sizes and shapes of dents. Brush on a water-base stain, I used Minwax American Walnut, use water-base because the craft paint is water-base. I left the stain on for maybe 30 seconds, then wiped off. Buff with a piece of brown paper bag. I wad up the brown paper a bit to make it soft before I use it. 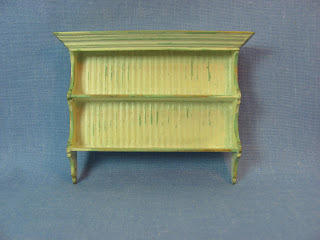 I am working on a limed finish to go over a piece of finished furniture. When I have a sample I will tell you about it. This is all of the furniture I have in stock that is NOT on CDHM.org. I thought I would update and put it all in one blog entry. Everything is 1 inch scale. Remember I can make any of these pieces with your fabric just contact me at camceiling@frontiernet.net. There is a $5.00 shipping charge for each piece or set, (in U.S.) I do ship international just contact me for more information. A set of slipper chairs upholstered in a Mary E. cotton fabric. They are trimmed in red twisted embroidery floss. Measurements are 3 1/2" tall, base 1 7/8" x 1 7/8" and 2 1/2" deep including slope of back. $15.00 for the pair. Bought Some New Used Books! I visited my used book store today and brought home 4 books. I went to the antiques section and found some GREAT furniture books. The first one is a catalog of Baker furniture from the 1980's, I think. It's the 68 edition, would like to find out what year that is. Love the measurements, they give inside and outside measurements of chairs and sofas! It's 264 pages and only 5 dollars. Then I bought a French book, literally in French, but the pictures are pretty! I figured out the words interiors and rustic, none of the pictures look too rustic to me. Every page has pictures of room settings, some color, 138 pages, hardback and only 5 dollars. Next one is Cabinet Makers and Designers by Hugh Honour . This has examples from the 16 century to present day of noted furniture makers and designers. 320 pages, hardback and 6 dollars. The last book is The Encyclopedia of Furniture by Joseph Aronson, it has 2000 illustrations, 480 pages and hardback, the cost 6 dollars. I will have a wonderful night of looking through these books and tagging the pages of the furniture I want to try. I think the Baker catalog is the best, I love getting these. I have only found 2 old furniture catalogs to date. I wonder why, they are lovely and I wouldn't throw them out. Ah . . . . but it's me, isn't? 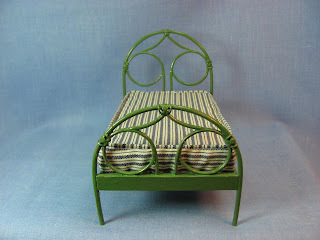 I am including pictures of a pair of custom sofas I made for a miniaturist from the U.K. She sent me a picture the full-size one and I made 2 for her. They are upholstered in white dupioni silk. 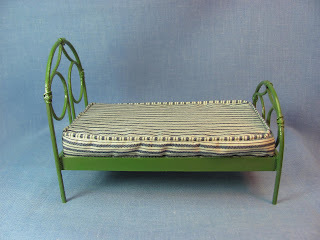 Working on a settee' for a miniaturist in Nova Scotia right now. Will try to put some new designs on CDHM.org soon.